Getting your look on point prior to a night out is essential. It doesn’t matter if you’re dressed to impressed if your makeup game is not up to snuff. You’ll need the best cosmetics to perfect your look and it would also be best if you’ve studied up on those brushing and contouring techniques. However, even if you have the best makeup kit on hand, you may be unable to bring out your natural beauty if you can’t comfortably apply your desired look. 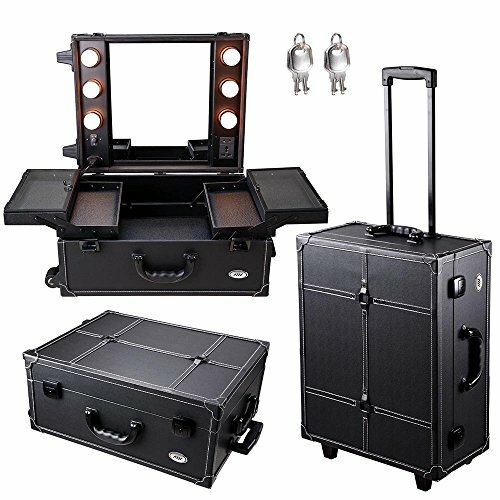 To help you perfect your look for each and every night out, you will want to have the best makeup vanity with lights and drawers. It would be really nice if we could have our own space in our home where we can just take our time and put on our makeup the way we want to. That’s not an option for many people though. 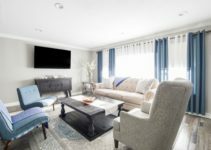 Homes have finite spaces available and while having a dedicated makeup room would be ideal, it’s not something that can always be prioritized. This is where the makeup vanity with lights and drawers can help you out. You can just add this piece of furniture to your bedroom and quickly turn it into a space more conducive to your beauty regimen. 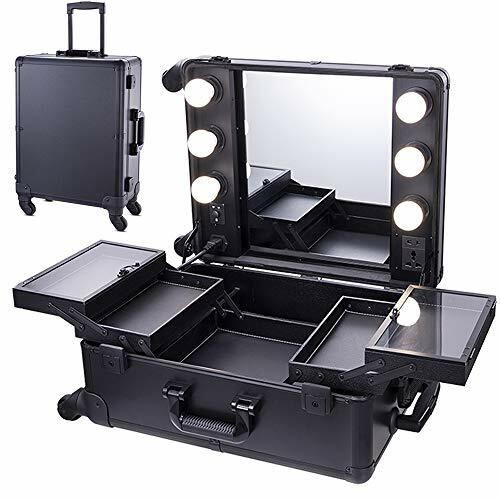 A portable makeup vanity, with a suitable vanity mirror will allow you to look your best even if you’re far from home. 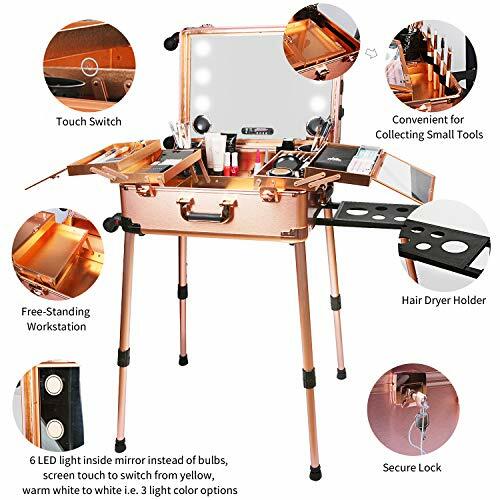 These pieces of furniture and handy kits will be able to illuminate your face properly so that you will know which spots need more makeup. They can also serve as storage units that will hold all of your cosmetic equipment. A makeup vanity with drawers and lights can also turn into a fixture in your home that will aid in your pursuit to look your best whenever you can. Let’s now take a closer look at the makeup vanity sets that you can bring into your home, including some bigger pieces of furniture and some more portable kits. 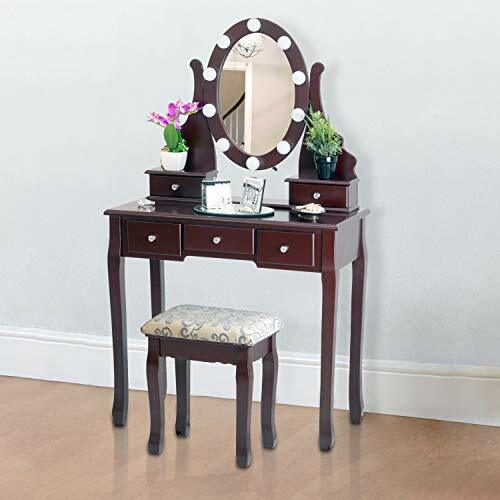 The Vanity Dressing Table Set from Giantex is likely very similar to what you picture in your head when you are thinking of this particular item. It features the classic form of a vanity table set and functions pretty much like one too. Let’s discuss the lights first. The 12 LED lights combine to provide what I see as adequate illumination. If the lighting in your bedroom is not that good, then you may find the lighting coming from this vanity makeup set to be somewhat lacking. The drawers are well-sized and they should be able to hold all of your basic makeup items. The tabletop itself is spacious enough to hold some additional items if you’ve already filled up the drawers. It’s always nice to find a makeup vanity with chair and in this case, that additional piece of furniture is going to keep you comfy as you work on your look. From my experience of working with this makeup vanity set, all the many pieces are quite sturdy. They should be able to remain in good working condition for a long time if you maintain them properly. This offering from Giantex is a classic set and it will be a positive addition to your home. You need your vanity makeup table set to work with you. If you need to see your face from a certain angle, you want the mirror included to accommodate you. For the sake of convenience and quickness, it’s just better to have a vanity table set that is more adjustable and customizable. 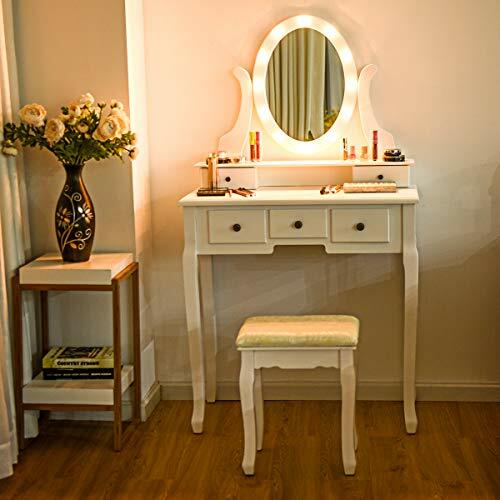 The main feature of the Vanity Dressing Table Set from Linlux is its rotating mirror. Regardless of whether you’re sitting down or standing up, you can adjust the way the mirror is angled to get a better look at your face. It’s a handy feature and one that will be able to help you out quite often. Once again though, the LED lights included with this makeup vanity with chair are not particularly bright. You will probably need to supplement it with other lighting in the room to get the desired effect. I also found the seat included to be a bit short, but it was still something I could work with. As far as useful space-savers go, you won’t have that much to complain about when using this makeup vanity set. It most certainly has its flaws, but when it comes to assisting with your makeup sessions, it does its job well. The small amount of space available in your bedroom can be limiting, but that doesn’t necessarily mean you have to forego all your plans of getting your own vanity makeup set. You just have to find the one that’s small enough to fit inside the limited amount of space you have. Fineboard’s Dressing Table has been scaled down in order to be more compatible with a larger number of homes, but that doesn’t mean that it has become any less useful. The drawers included are still able to hold plenty of your beautifying items and the lights are bright enough to aid with your makeup session. This is a makeup vanity with chair, but you may end up needing to grab something else to sit on as you apply makeup. The chair that is bundled together with this set is simply too small and it will make it more difficult to see where you need to apply more makeup. The surface of the table itself is a good size and you can spread out all of your cosmetic equipment on top of it before you begin if you so desire. You can also turn this vanity set into a decorative item whenever it’s not in use. Vanity makeup sets are supposed to help you look good, but wouldn’t it be nice to have one that also effortlessly elevated the styling of your home interior? I think we all know the answer to that question and in search of that type of item, I’ve stumbled upon the Hollywood Swank Vanity with Bench Set from Aico. 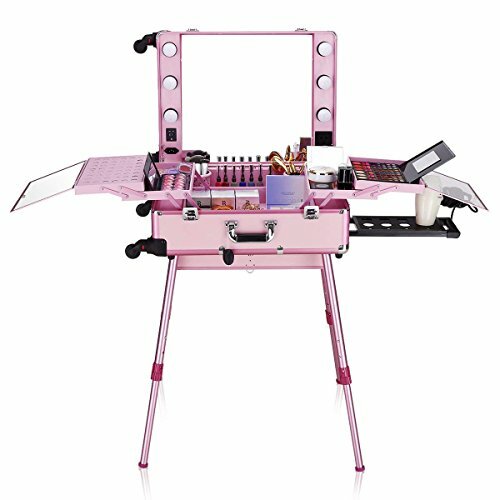 This is not your ordinary makeup vanity with chair set. You can immediately see that a lot of work went into making this vanity set a truly stunning piece of craftsmanship. Leather and vinyl have been used to give this piece of furniture a distinct look – one synonymous with elegance. A closer look reveals the fine detailing on the materials. In terms of functionality, you also won’t have a lot to complain about with this vanity table set. You are given 11 spacious drawers to use for storage and the tabletop is also large enough to host all your frequently used cosmetics. Even the vanity mirror lighting manages to be suitably bright without bordering on blinding. This is the kind of makeup vanity that I would proudly display in any room inside my house and one that is most certainly worth owning. Being eco-friendly with our purchases is becoming more and more important. If you want to continue supporting sustainable manufacturing practices and companies that make an effort to put forth quality goods made out of recyclable materials, then you will likely be interested in what LUVODI has to offer. LUVODI’s Vanity Table Set is made out of 98.5 percent recyclable materials. The company also makes it a point not to use toxic substances in their products to make them even friendlier to the environment. The LED lights are also bright enough that you should be able to see clearly even in poorly-lit rooms and the vanity mirror is on the bigger side. You’re not going to have a ton of storage space to work with if you choose to purchase this item. All you’re really getting is one big drawer and you may struggle to fit all your beauty items in there. It’s a good thing that the tabletop is nice and open so you do have a bit of additional space to work with while putting on your makeup. I wish there was a chair included to better round out the package, but the vanity set as currently constituted remains a worthy purchase. We’re now going to look at the more portable vanity kits, starting with the Small LED Makeup Train Case from Ovonni. It’s obviously quite different from a more conventional makeup vanity with drawers and lights, but as you’ll quickly learn, it remains a very helpful item. The first thing I want to point out is that this makeup kit has some very bright lights. You probably don’t expect that from a portable item, but there’s enough power in the lights to properly illuminate a dark room. The mirror is kind of narrow, but as long as you don’t sit too close to the kit, it should still be able to capture your entire face. You don’t need to sit too close anyway because of the lighting. When it comes to storage, well, this Ovonni item does what it can. You are given access to four fold-out trays and a larger compartment beneath. The compartment can hold a good amount of stuff, but the same is not the case for the smaller trays. After storing the essential items, you may not have that much room left in this kit to store anything else. Lastly, there are four wheels included with this makeup kit and those will make traveling easier. If you find yourself struggling with the item listed directly above, then you’ll probably need a makeup kit with more size. Ovonni has another offering that fits that description and it could be what you need when you want to look good wherever you go. Ovonni’s LED Makeup Train Case is quite similar to the previously reviewed Ovonni item except that the former is bigger in a few ways. The larger trays are fantastic additions. They’re still not as roomy as the ones included in more conventional vanities, but they can still hold a good amount of your beautifying items. A foam insert has also been added to provide you with an extra surface to place items on. Thanks to the telescoping legs that come with this makeup kit, you won’t have to set it on top of a table just to get a comfortable view. The folks at Ovonni have a good sense for picking out LED lights because they offer just the right amount of brightness. If the room you’re in is sufficiently bright, you can dim the LED lights so that they won’t clash with the already available illumination. The only downside to this makeup kit is that’s heavy and it may be a bit troublesome to take everywhere. You’ll be able to tell right away that Jula Vance’s Makeup Train Suitcase looks remarkably similar to the standing train case from Ovonni. From afar, they may even look identical. However, they differ enough that this Jula Vance product warrants a spot in this article. The biggest difference between Ovonni’s standing makeup kit and this one from Jula Vance is the way the lights are set up. In the Ovonni kit, the lights are set along the sides of the mirror. In this Jula Vance kit, the lights are built into the mirror itself. It’s up to you to decide which set up is better, but the lights built into the mirror do cool down faster, which can be really helpful when you’re in a hurry. I would say that the amounts of storage space offered by the two makeup kits are about the same and they are both quite durable as well. The legs are also as sturdy as you need them to be. Expect some difficulties the first few times you’re using this makeup kit because setting it up can be tricky. Once you get used to the process though, you should be able to set up and store this kit quickly. The portable makeup vanity with lights and drawers you’re using doesn’t just have to be a functional wonder. It can also be a stylish item you take on the road. That is an accurate description of the Pro Studio Artist Train Makeup Case from Chende. The moment you open up the case, you will see all the work that went into making this makeup kit as gorgeous as it can be. The interior is lined with leather and the all-black exterior is subtle yet stylish. 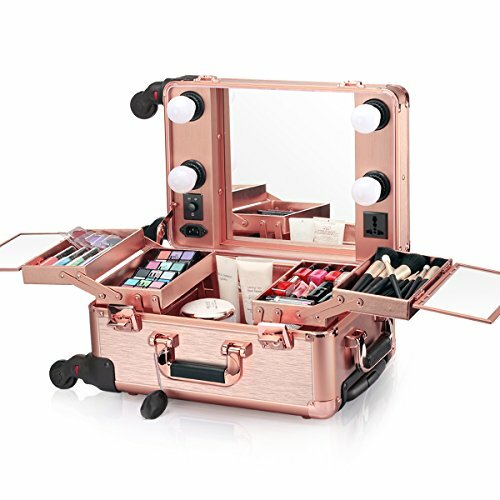 When it comes time to use this makeup case, you will notice that the lights are quite bright. Depending on where you’re applying makeup, that feature can either be very helpful or a bit of a bother. You get a decent amount of storage space from this makeup kit. The inner compartment is deep but not very wide and the smaller trays fan out quite well making it easier for you retrieve your makeup supplies. There are no legs included with this makeup kit though, so you’ll have to rest it on top of a table before using it. The omni-directional wheels are a nice touch and they make traveling with this makeup case less of a hassle. We’re finishing this list with one more portable makeup kit, with this one being the AW Rolling Studio Makeup Artist Cosmetic Case. Being last by no means translates to this item being inferior to the ones we have reviewed already though. On the subject of cosmetic care, you can even argue that this case is better than all the other options provided. The material used to make this makeup case is heat-resistant. You don’t need to worry about your makeup supplies being ruined if you decide to use this case. The amount of storage space offered by this makeup case is adequate, but there are times when I’ve found myself wishing that I just had one extra tray to put an item on instead of having to hold said item. The lights are also not the brightest that you’ll ever see included with a makeup vanity, but they do their job well and will still assist you during your beauty session. Traveling with this makeup case in tow is no issue. It moves easily thanks to how the wheels are aligned and you won’t feel like you’re pulling a sack of potatoes. The all-black exterior is also pretty to look at. With that, our look at various makeup vanities has come to an end. 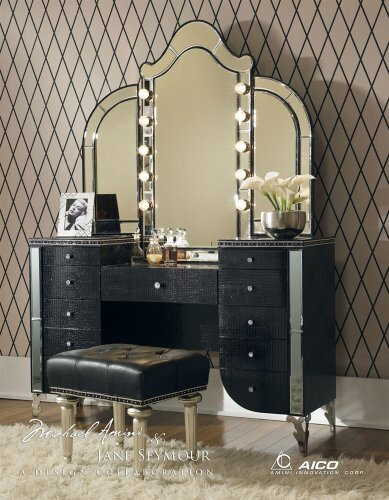 Hopefully, you have found the makeup vanity with drawers and lights that perfectly suits your preferences. Applying makeup should be an enjoyable process. 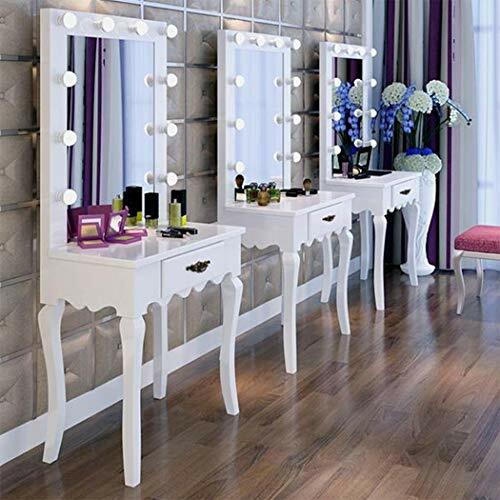 With the right vanity set in your possession, getting all glammed up will be something you look forward to all the time.